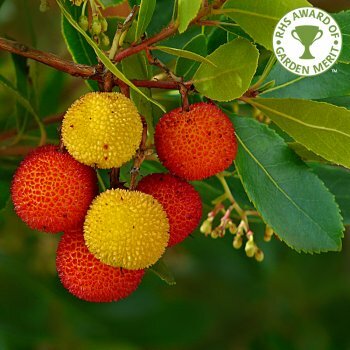 Arbutus unedo, known as the Strawberry tree, is a small evergreen tree which produces bright-red fruits in the autumn, along with pendulous clusters of white, urn shaped flowers in November. The fruits are popular with birds and although can be eaten by humans, are unpleasant. With its evergreen bay like leaves and rich terracotta brown, tactile, peeling bark and dark evergreen bay like leaves, the feature packed Strawberry tree is very popular. Tolerant of pollution, acid and alkaline soils and exposed coastal positions, Arbutus unedo is quite resilient but will prefer a sheltered spot in full sun. This evergreen tree is spreading in form, reaching 5 x 4 metres in 20 years and makes a wonderful addition to smaller gardens and is ideal for screening purposes. We grow the Strawberry tree in both bush and tree forms, the latter makes a makes a good shaped specimen tree. Our pot grown Arbutus unedo trees can be planted at any time of year. Choose a sunny, preferably sheltered, planting position and remove weeds and grass within a metre. Dig a square hole as deep as the root mass and approximately 2x as wide. Sprinkle root grow in the hole to help Arbutus establish more effectively. Remove the pot, gently loosen the roots and place into the planting hole. Mix 50% of the original soil with 50% compost, fill in the hole and firm around gently, taking care not to bank soil up around the collar of the tree. We recommend planting Strawberry trees (not the bush forms) with a stake and tie kit - instructions are in the online planting guide. If you’re planting Arbutus unedo in spring or summer, water well for the first few months. Increase watering if there are extended periods of hot or dry weather. If planting in autumn, you may only need to water a little. Strawberry trees do not require a lot of pruning. Simply remove dead, diseased or awkwardly placed branches as and when you see them.